This page contains resources about Mathematical Optimization, Computational Optimization and Operations Research. More specific information is included in each subfield. See Category:Optimization for some of its subfields. Chong, E. K., & Zak, S. H. (2013). An Introduction to Optimization. John Wiley & Sons. Luenberger, D. G., & Ye, Y. (2008). Linear and Nonlinear Programming. Springer. Bertsekas, D. P. (2017). Dynamic Programming and Optimal Control. 4th Ed. Athena Scientific. Bertsekas, D. P. (2016). Nonlinear Programming. 3rd Ed. Athena scientific. Hazan, E. (2015). Introduction to Online Convex Optimization. Foundations and Trends® in Optimization, 2(3-4), 157-325. Bertsekas, D. P. (2015). Convex Optimization Algorithms. Athena Scientific. Puterman, M. L. (2014). Markov decision processes: discrete stochastic dynamic programming. John Wiley & Sons. Fletcher, R. (2013). Practical Methods of Optimization. John Wiley & Sons. Shalev-Shwartz, S. (2011). Online Learning and Online Convex Optimization.Foundations and Trends® in Machine Learning, 4(2), 107-194. Sra, S., Nowozin, S., & Wright, S. J. (2012). Optimization for machine learning. MIT Press. Luke, S. (2009). Essentials of Metaheuristics. Raleigh: Lulu. Press, W. H. (2007). Numerical Recipes 3rd edition: The Art of Scientific Computing. Cambridge University Press. Nocedal, J., & Wright, S. J. (2006). Numerical Optimization. Springer. Ruszczyński, A. (2006). Nonlinear Optimization. Princeton University Press. Boyd, S. P., & Vandenberghe, L. (2004). Convex Optimization. Cambridge university Press. Nesterov, Y., & Nesterov, I. E. (2004). Introductory Lectures on Convex Optimization: A Basic Course. Springer. Saad, Y. (2003). Iterative Methods for Sparse Linear Systems. Siam. Vogel, C. R. (2002). Computational Methods for Inverse Problems. Siam. Kelley, C. T. (1999). Iterative Methods for Optimization. Siam. Dennis Jr, J. E., & Schnabel, R. B. (1996). 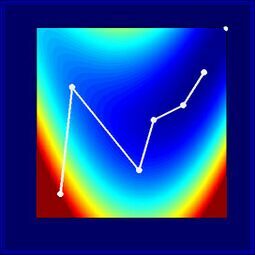 Numerical Methods for Unconstrained Optimization and Nonlinear Equations. Siam. Rustagi, J. S. (1994). Optimization techniques in statistics. Elsevier. Scales, L. E. (1985). Introduction to non-linear optimization. Springer-Verlag. See List of Optimization Software for the complete list.